When you're dorm decorating, one of the things on your mind is making your dorm room cool, relaxing, and most of all, unique. For unique college dorm room decor items, you're going to want to think outside of the box a little bit. College posters are basic cheap dorm supplies that you'll see every college student bringing into their college dorm room. However, just because they're dorm essentials that every college student has doesn't mean they can't be one of a kind college supplies! Our Chimp Mug Shot College Poster is a one of a kind college supplies item that will add fun humor to your college wall decor! Our Chimp Mug Shot College Poster is a college poster that is a little different from a dorm poster of scenery or famous personalities. In fact, it's quite different from other college posters of animals as well! This dorm necessities item features a mug shot of a chimp wearing headphones. You can't get much more one of a kind than that for your dorm essentials! Your dorm room decor is important for making your college dorm room comfortable, but it's also important for making your dorm room a cool place to hang out and relax with friends. 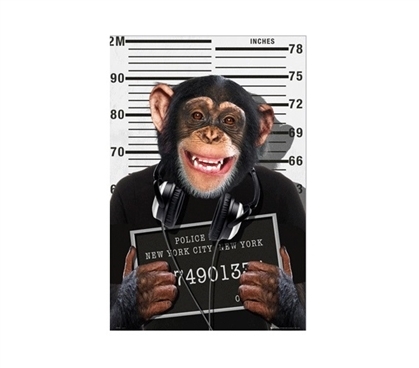 Express your personality and sense of humor with our Chimp Mug Shot Dorm Poster!